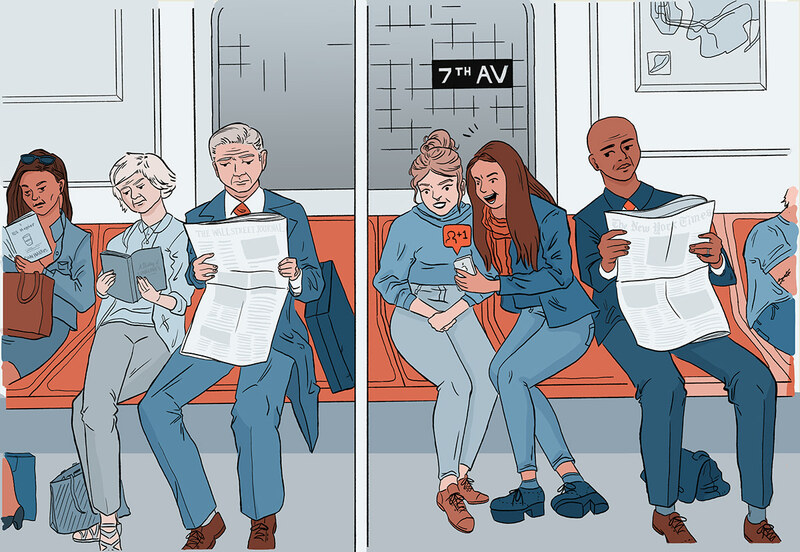 Re-coloring of an older project on being social. The worst sin toward our fellow creatures is not to hate them, but to be indiffernet to them: that's the essence of inhumanity. - George Bernard Shaw This was a project for my Illustration IV class at Pratt, where I had to interpret a quotation on inhumanity through illustration. I chose to interpret the quote as a person of the older generations making a comment about millennials, about how my generation are constantly on our phones and it is making us anti social. I find this paradoxical, because while a millennial is on his or her phone, they are connecting with friends through social media, while someone of the older generation is more or less keeping to themselves. The point of the illustration was to depict the unfair treatment younger generations receive from the older generations because of the advance in technology.